There are several ways to restore files in Syncrify. To restore entire profile, click the right mouse button and select Restore/Entire Profile. See image on the right for a screenshot. This option will restore every single file and can be dangerous. If files are missing they will get restored from the server. A newer file will get replaced by an older copy from the server. Therefore, use this option only if files are either corrupted or are missing on the client's machine. Users can restore their backed up files from any browser, running either on a desktop or a mobile device. Connect to the web interface using either a desktop computer or a mobile device. Supported devices are phones and tablets running iOS, Android or Windows. The web interface will display an Explorer like window allowing users to download any file. This method is useful for restoring a handful of files or accessing them from a remote location. 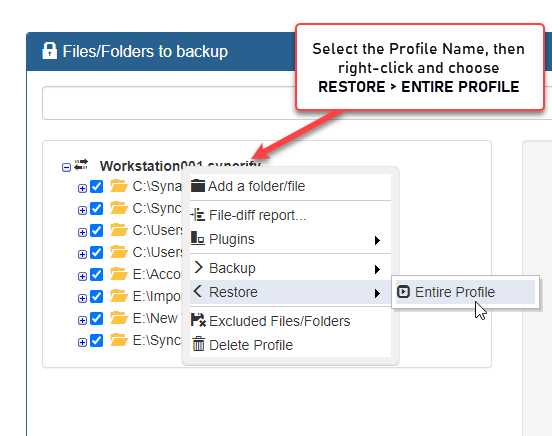 Use this option to restore entire profile from the server's end to a USB drive and then carry over the files physically to the client's machine. Click here for details.